GUTHRIE, Okla. – The lead changes on opening day of the CINCH Timed Event Championship resembled a Final Four basketball game. 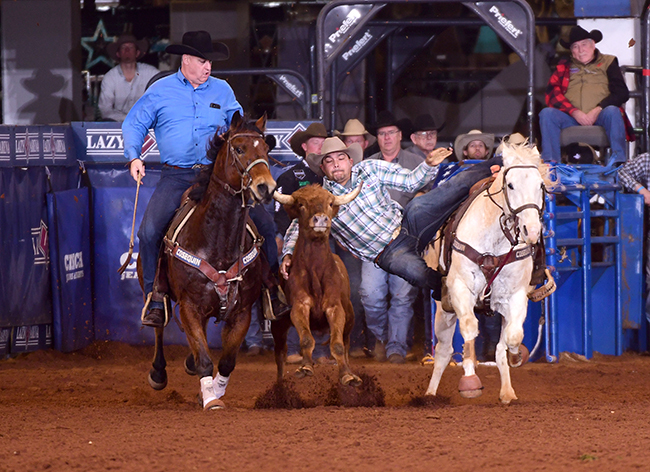 By the time Friday night’s second round came to an end, Texan Cash Myers remained at the top of the list by knocking down 10 animals in a cumulative time of 121.9 seconds, but Navajo cowboy Erich Rogers has placed himself in a solid No. 2 spot with 128.7. The two cowboys also were the round winners on Day 1 – Myers has the fastest of the day by winning the first round in 51.8 seconds, while Rogers was 55 seconds to win the evening performance. Each man earned $3,000 by doing so. “This is one of my best starts,” said Myers of Athens, Texas. “I’ve gone into the final round in the lead, but really, there’s only one time when it’s good to go ahead in the race is when it’s over. That includes his best friend, 2015 world champion header Aaron Tsinigine, and four-time steer wrestling world champion Ote Berry, who has allowed Rogers to borrow a bulldogging horse while Berry has served as his hazer. In fact, Rogers’ second-round time was aided by the fastest steer wrestling run of the Timed Event so far, 4.3 seconds. A decade ago, Myers was a regular in this field of 20 all-around cowboys, who must compete in each of the five timed-event disciplines to finish a round. Though he’s been away from the game for the better part of the last eight years, he’s excited to be in the mix again. He has a lot of the tools necessary to do well; he has qualified for the National Finals in steer wrestling, tie-down roping and steer roping, which make up three of the five. “I’ve done those three events in my career, but we team rope a bunch at home,” said Myers, who missed last year’s “Ironman of ProRodeo” because of an injured knee, which kept him away from competition for much of the year. “Having to recover from the injury last year was a blessing in some ways. I couldn’t rope (calves) and bulldog, so I team roped a bunch. It’s showed in the opening two rounds, but three more remain. The third round will begin at noon Saturday. During Friday’s opening round of the Jr. Ironman, reigning champion Bo Yaussi of Udall, Kan., roped, wrestled and tied four animals in 42.3 seconds to win $1,000 – the younger competitors do not compete in steer roping. He owns a 13.6-second lead over the No. 2 man, Myles Neighbors of Benton, Ark. The weekend features 20 of the greatest all-around cowboys in ProRodeo and 10 of the top up-and-coming stars in the game. Now in its 34th year, it’s become a Lazy E Arena staple. First round: 1. Cash Myers, 51.8 seconds, $3,000; 2. Trevor Brazile, 65.1, $2,000; 3. Russell Cardoza, 67.7, $1,000. Second round: 1. Erich Rogers, 55.0 seconds, $3,000; 2. JoJo LeMond, 59, $2,000; 3. Jordan Ketscher, $1,000. Average leaders: 1. Cash Myers, 121.9 seconds on 10 runs; 2. Erich Rogers, 128.7; 3. JoJo LeMond, 133.1; 4. Jordan Ketscher, 133.4; 5. Russell Cardoza, 144.1. Jr. Ironman first round: 1. Bo Yaussi, 42.3 seconds, $1,000; 2. Myles Neighbors, 55.9; 3. Wyatt Hansen, 59.8.